This book is a remarkable contribution to the literature concerning chronic fatigue syndrome. In 1990, at the age of thirty, Valerie Free suddenly came down with a flu-like illness. Several months later, she was diagnosed with chronic fatigue syndrome, or CFS. 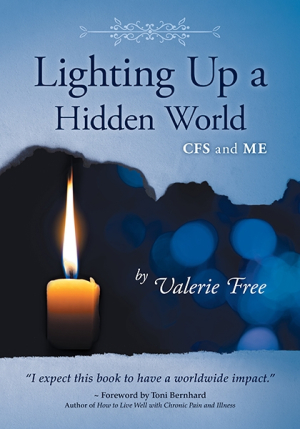 Lighting Up a Hidden World: CFS and ME blends poetry, artwork, personal experience, and science to shine light on a baffling, life-draining, isolating chronic illness that, despite its devastating effect on millions of people worldwide, receives little attention. To date, there is no standard approved treatment and no cure. The book is full of information about the condition also known as myalgic encephalomyelitis (ME), or, combined, as ME/CFS. ME means an inflammation of the brain and spinal cord accompanied by muscle pain. ME/CFS, it reveals, often begins with what appears to be a cold or the flu, and progresses to leave its victims housebound and often confined to bed with symptoms that include sleep dysfunction, muscle pain and weakness, numbness, fatigue, central nervous system problems, and neurological and cognitive dysfunction, all of which can lead to depression and sometimes suicidal ideation. Free’s poignant story of the toll that ME/CFS has taken on her life is moving, but also features gentle humor. Taking a multifaceted approach to her topic, Free first tells her own illness story via a narrative poem written in the rhythm of the song “My Favorite Things” from The Sound of Music. She then elaborates each stanza of this personal narrative with meticulous research on the history, characteristics, and effects of the disease, and the state of current knowledge. The second part of the book further illuminates the topic through the stories of those within the ME/CFS community, who daily battle stigma, lack of understanding and compassion, and even actual persecution as they struggle with the condition. Footnotes further clarify the well-documented text, and ample resources are provided that will inform and benefit health-care professionals, those with ME/CFS, and sufferers’ caregivers, friends, and families. Free’s writing is eloquent, and her voice is both intimate and powerful. The interior layout and design facilitate reading pleasure and comprehension, and the book is enhanced by whimsical, touching black-and-white illustrations that often bring a smile. Valerie Free’s Lighting Up a Hidden World is a remarkable contribution. In it, she illuminates a hidden world, inspires passion and hope, and issues a powerful call for action on behalf of those whose suffering has too long been ignored.